Husband & Wife Team. Coaches. Life-Long-Learners. L-sit in the middle of the Devil's Punchbowl on the Oregon Coast. This move is a combo of hip, core, and arm strength, not to mention flexibility! At CFP, we will get you fit, but we'll get you smiling, laughing, and having fun in the process! YOU are your OWN gym. When you know how to work your body as a unit, you can bring your "gym" everywhere! 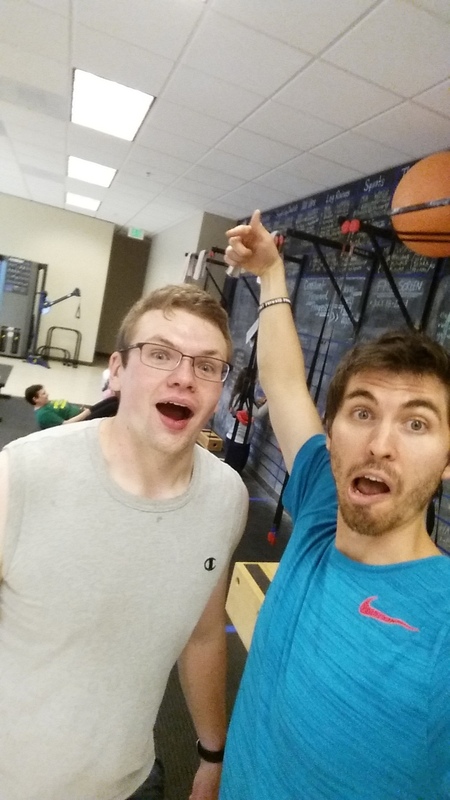 We are Portland's only Progressive Calisthenics Certified coaches! 3 days, 24 hours of instruction, and a demanding test at the end. We will make you feel welcome, encouraged, and feel better when you leave than you came in, guaranteed! Bret is indeed human, and his favorite food is pizza. Does he eat it every day? No. But when he does, he makes sure it's GOOD. Bodyweight Training has made possible to perform "random acts of fitness" like pistol squats, whenever and wherever! Having fun with Archer Pullup practice at the Progressive Calisthenics Certification in NY! Providing help along the way. Kettlebell Training is excellent for total body conditioning, effective for losing fat, and the perfect complement to bodyweight training. What I do at CCG: Originally founded Constant Forward Progress in August, 2014. Rebranded to Cornerstone Calisthenics Gym in 2018. Favorite Part of the Job: The relationships I've built up with our members make me look forward to each day. Other notable skills: Trampoline jumping, pickleball playing, blog-writing, book-reading, and nerding-out on cars, soccer, and video games. Favorite quote: "It doesn't matter how much you know, until they know how much you care." Favorite movie: Back to the Future; Indiana Jones and the Last Crusade. Finding ways to be active outside is a HUGE passion for us, riding bikes/hiking/playing every single day! Pistol Squat Practice in the Tulip Fields! Kettlebell Training is the perfect complement to Bodyweight Training. We use both extensively at CFP, and together they provide a comprehensive, balanced, total-body workout! Pretending to be a model in our CFP t-shirt! Here at CFP we strive to live out our brand, we always believe in making Constant Forward Progress in our lives, business, and relationships with others, becoming a little bit better every day. Human Flag Practice on the Playground! Our brand focuses on creating an atmosphere that is F U N! Passed the PCC "Century" test! Proud to be an official Progressive Calisthenics Instructor, woohoo! I'm passionate about finding ways to LOVE yourself, each and every day and showing our members that they too CAN/SHOULD love where they are and what shapes them into the person that they are. We are not just about changing your appearance. We are about helping our members become a STRONGER, HEALTHIER and BETTER version of themselves, both inside and out! Let's be honest, food is GOOD! If I indulge...it's usually chocolate! Our motto follows the idea of less is more, eat what you need, indulge in life's goodness when you can! Earning your name on the CFP Wall of Fame ALWAYS makes us feel PROUD. We love celebrating our members' successes! Conquering the basics and mastering the basics are vital to survival in Progressive Calisthenics. The full pushup is often an exercise that is underestimated and often HARD to truly master. Yoga, sprinting, pickle ball, frisbee golf, biking, hiking and jumping on our BIG trampoline are ALL things we LOVE. 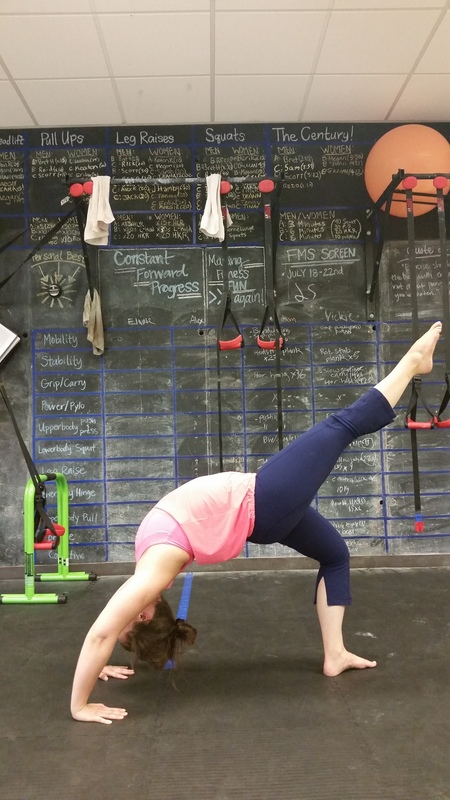 Our progressive bridging exercises are awesome for beginners to the most advanced! Working out should be FUN, playful and challenging all at the same time. What I do at CCG: Co-owner, assistant coach, and behind the scenes boss since 2016. Education: BS Social Science: Certification in Early Childhood Education from Portland State University. Certifications: American Council on Exercise Certified Personal Trainer (ACE); Progressive Calisthenics Certified (PCC). Favorite part of the job: I love the relationships I've built with the members at our gym, those authentic relationships make my job easily the best job ever! Other notable skills: Excellent at homemaking, photography, writing, crafting, organizing, instagramming, scrapbooking, and thrift-store shopping. Favorite color: Purple or yellow, depending on the day! Favorite movie: My Best Friend's Wedding, the Harry Potter series, anything that makes me laugh! Favorite band/musician: Sugarland, Katie Perry, most country music. Favorite book/author: The Ragamuffin Gospel by Brennan Manning; any Nicholas Sparks book.